Our goal is to create a community of researchers who understand the technological challenges, environmental implications, socioeconomic, and regulatory hurdles of offshore wind farms. In 2011 the University of Massachusetts Amherst received a $3.2 million grant from the National Science Foundation Integrative Graduate Education and Research Traineeship (IGERT) program to start an interdisciplinary graduate program in Offshore Wind Energy. 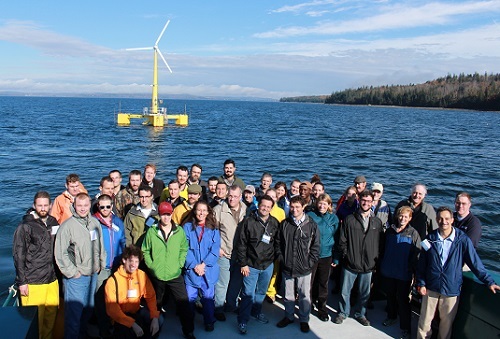 The program has trained 30 doctoral students over the course of seven years in the technology, environmental implications, and social/economic/regulatory challenges of offshore wind farms. The multidisciplinary program features more than 20 faculty members from eight UMass Amherst departments in the College of Engineering, College of Natural Sciences, School of Management, and College of Social and Behavioral Science. We are no longer accepting applications for the IGERT program; however we are acceepting applications to join the Wind Energy Fellows. The purpose of the Wind Energy Fellows program is to support the education of a new generation of researchers able to integrate engineering, environmental science, and social science to better position the U.S. in global competitiveness in wind energy and related technologies. The Wind Energy Fellows is a program for graduate students studying areas with relevance to wind energy. We are interested in students from a wide range of fields, including environmental sciences, social sciences, science, and engineering. Better understanding of technological and environmental constraints as well as public concerns will enable wind farm designs that have a greater likelihood of successful approval and construction. The challenges of increasing wind energy market penetration are complex, and involve technological, environmental, and policy/regulatory issues. Experience with proposed offshore wind farms in the U.S. to date demonstrates that environmental and policy issues are just as important as solving the engineering challenges. The success in siting the Block Island Wind Farm, the first offshore wind farm in the U.S. underscores the critical need for an integrated, cohesive, multidisciplinary approach to offshore wind energy development that achieves technical excellence while reaching out to the public early in the process. Multidisciplinary communication among experts, and from experts to and from the public is an essential, but currently under-researched, component of the design and approval process. We believe that a better understanding of technological and environmental constraints as well as public concerns will enable wind farm designs that have a greater likelihood of successful approval and construction. Creating energy from wind is not new, yet growing demands for clean power now has us looking out to sea. Coastal seas and open oceans are breezy by nature, potentially making offshore wind farms an economical source of renewable energy. Nevertheless, offshore wind farms are not without controversy, whether because of changes in the aesthetics of the coastline, potential impacts on navigation, or disturbance to seabirds, fish, and marine mammals. Still, the number of proposed offshore wind farms is growing rapidly, and it is becoming clear that the future of offshore wind relies on a holistic, interdisciplinary approach that includes technical assessments and planning, as well as assessments of environmental impacts, regulatory and policy issues, and human dimensions.